That’s the plea of a video released today by a local clean air group claiming the state has so intentionally sabotaged Dallas-Fort Worth anti-smog efforts that residents now need EPA to take over the job. “Texas is as likely to enforce the Clean Air Act in 2015 as Mississippi was to enforce the Voting Rights Act in 1965,” said Downwinders at Risk’s Director Jim Schermbeck, echoing a line in the video. The group posted the 2:42 minute piece, titled “SOS @EPA” in response to this morning's vote by the Texas Commission on Environmental Quality (TCEQ) to move forward with a new anti-smog plan for DFW that the Commission has already been told by EPA falls short of legal and regulatory requirements. In the video, footage from a Downwinders’ street action calling for help at EPA Regional Headquarters in downtown Dallas November 5th is spliced with facts about DFW’s 20 years and counting chronic smog problem. Central to the group’s charge is the state’s unwillingness to put new controls on major sources of industrial air pollution like the Midlothian cement kilns, East Texas coal plants, and gas facilities – despite the fact their own air modeling shows those controls could bring smog down enough to comply with the Clean Air Act. Today’s vote by the TCEQ is the second in 12 months concerning the same DFW air plan. Its goal is to get from an average of 83 parts per billion (ppb) of smog in 2015 down to the current federal standard of 75 ppb by 2017. However, the state only estimates a best-case result of almost 78 ppb. Despite that shortfall, there are no new pollution controls required of any major sources. Over the last 20 years, the state has written five anti-smog plans for DFW. None has accomplished its goal on deadline, and regional smog levels actually rose this year. Besides once again failing to hit is mark overall, the EPA has already told the State its formal assessment of modern pollution controls for those major sources needed revisiting to be legal. TCEQ refused to comply with EPA and today’s plan contains exactly the same assessment as the one EPA has already said isn’t sufficient, making that part of the plan instantly illegal. Although EPA gives state governments authorization to write smog plans for their own metropolitan areas, it still has final approval based on criteria listed in the Clean Air Act. One of the points made in the group’s video is that studies by local hospitals have shown DFW childhood asthma rates to be as much as four times the state average and over twice the national average, making the need for cleaner air imperative. “The health of seven million Dallas-Fort Worth residents is being held hostage by a state government hostile to the goal of clean air. Only federal intervention can save us,” said Schermbeck. The video can be found at Downwinders at Risk’s website (downwindersatrisk.org), it’s Facebook page, twitter account (@cleaner air) and the group’s YouTube channel (Downwinders’ TV). LIKE THIS VIDEO? LIKE OUR WORK? THINK IT'S IMPORTANT? THEN PLEASE MAKE A TAX-DEDUCTABLE CONTRIBUTION TO DOWNWINDERS BEFORE DECEMBER 31st. It might be hard to believe, but despite being the nation’s fourth largest metropolitan area, AND being in constant violation of the Clean Air Act for smog since 1991, AND having higher annual smog numbers than Houston, AND being singled out by EPA as one of only a handful of areas expecting to STILL be in violation of the Clean Air Act in 2025, there’s still only one professional staff person devoted to cleaning up DFW air: the staff person you pay for when you contribute to Downwinders at Risk. Besides community organizing on the ground, Downwinders also had to go out and build a new committee of local officials concerned about dirty air after the traditional regional air quality planning process broke down. That committee produced a first-ever study showing how new pollution controls on the kilns, coal plants, and compressors could bring smog levels down enough to comply with the Clean Air Act. Our study was used by the Dallas Commissioners Court to pass a resolution requesting new controls on the East Texas coal plants in October. Had it not been for our new committee, there would have been no local officials involved in the DFW air quality planning process at all, and noaccountability for a state government that isn’t interested in our lungs. 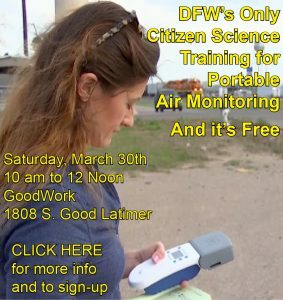 Want to get just basic information about DFW air pollution? There are no dedicated environmental beat reporters left in DFW. 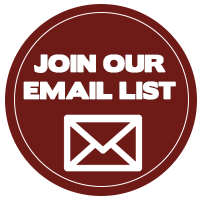 Downwinders fills this gap as well, providing the only source of reliable and timely information on DFW air quality issues. When you give to Downwinders, you fund the last line of defense between your lungs and a state government that doesn’t believe smog is that bad for you. And when you give to Downwinders, you know you’re giving to a group with a two decade proven track record of getting results. That’s our pitch. We get your donation. You get our best effort at protecting your lungs. On behalf of myself, and the Downwinders at Risk board, thank you for your consideration.